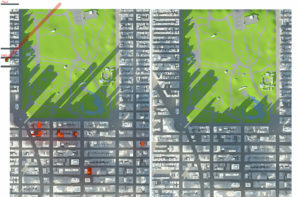 Will Central Park Become CENTRAL dARK? A supertall tower could rise on West 66th Street casting shadows on residential blocks, landmark designated buildings, and Central Park. Leading this assault on our public assets is a developer in partnership including Extell, aided by the kind of laissez-faire pro-real estate policies that sanction the supertall towers transforming NYC’s midtown skyline. Yet, developer plans filed with the Department of Buildings show only a 25-story building. Does this seem shady to you? for the impact on the lives and neighborhoods of everyday people. Towers of unprecedented height have largely been built as-of-right without any public review or analysis of impacts on neighbors, historic resources, infrastructure (transportation, sanitation, emergency services, storm resilience), and quality of public space. Mayor de Blasio’s Department of City Planning defends these towers, under heavy pressure from real-estate developers and their lobbyists. Current regulations allow adjacent sites to be assembled and provide floor area bonuses to facilitate construction of new buildings that far exceed heights of existing buildings. These regulations fail to acknowledge new construction technology that enable super-tall buildings on relatively small lots, casting significantly longer shadows than ever anticipated by the NYC Zoning Resolution. The Zoning Resolution that allows these towers and their shadows has not been comprehensively updated in over 50 years. Tax loopholes and other policies incentivize investment in tower construction — for example, LLC and 421-a tax exemptions. There is no publicly accessible source for tracking the transfer of development rights from one site to another, resulting in a lack of transparency and predictability. * We’re all in it together. LW! works with colleague groups throughout the city to amplify our voice. Several points above are adapted from a May 2015 report by the Central Park Sunshine Task Force of Community Board 5, with the inspiration form the “Accidental Skyline” by the Municipal Art Society of New York and New Yorkers for a Human Scale City.